My fascination with cycling, like many people, began with Lance Armstrong. A man who won seven Tour de France titles after beating a cancer that nearly killed him. However, unlike most it was not this story that drew me in, instead it was his downfall, this great and untouchable man brought to his knees by a "reasoned decision." Bradley Wiggin's victory contributed, the first Brit to win the tour, but it was Armstrong that kept me interested. I followed the proceedings religiously, even following him on twitter - seeing his defiant layin' around tweet - until the interview when he revealed all. One question stood out to me, how no one could have known, it seemed so obvious, the evidence had been in plain sight for years. 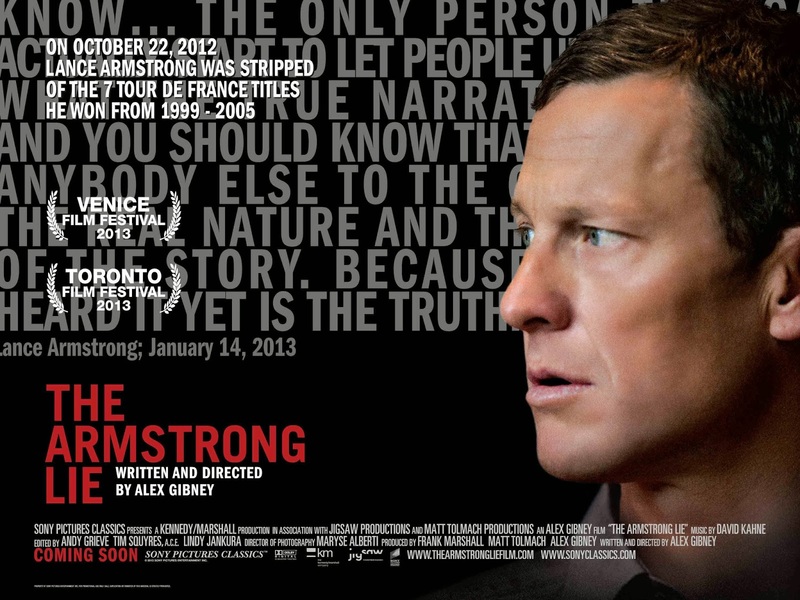 Alex Gibney's The Armstrong Lie tackles this question. Gibney began following Armstrong's comeback year in 2009. He was given unprecedented access to the cyclist - filming his drug tests, training regimes and even his family life in the run up to the 2009 tour. Initially, Gibney wished to explore why Armstrong came back and what he is out to prove, but following the federal investigation into doping Gibney sat on the footage and waited. By 2013, Armstrong's lie was outed; he was disgraced with his reputation in tatters, and so Gibney organised one more interview to set the record straight. In the documentary Gibney presents his own personal story, a story of how he was drawn in to the lie. He uses interviews with Armstrong from his comeback years and following the Oprah interview. Interviews with colleagues and journalists are interspersed throughout, fellow teammates including Frankie Andreu and George Hincapie, and long-time critics like David Walsh. The first part discusses the history of doping in cycling from alcohol; the first performance enhancing drug (PED), to the emergence of EPO and blood transfusions, before moving on to Armstrong, his cancer battle, recovery, his tour wins and elevation to superstardom. It discusses his charity and work to raise cancer awareness, and importantly it presents his doping denials and the ruthless dismantling and discrediting of his opponents. In the second part Gibney charts Armstrong's comeback year, from the announcement, to his ride at the Giro d'Italia and finally his Tour. During this Gibney manages to do something extraordinary, he makes you believe the lie. You see Armstrong's confidence that he can win an eighth tour, his sadness when he's beaten in the first stage and his acceptance that he isn't good enough when Alberto Contador (rival, teammate and fellow drug cheat) takes him on and wins. Armstrong’s comeback story comes to a head on Mt Ventoux, a legend of the Tour de France - the mountain Froome climbed solo in last year’s race - and one that had always defeated Lance. Armstrong needs to finish with his rivals to secure a podium position and I, along with Gibney, am there cheering him on, hoping he can do it...and he does. Gibney cites this as the point where he believed the lie completely, and I wanted to believe it too, despite all I knew. You're almost pleased when you see on the podium, he did it. Gibney sets you up and then knocks you down, showing you how he felt when the lie came crashing down. Floyd Landis and Tyler Hamilton speak out, the US government goes after him, and then finally USADA (United States Anti-Doping Agency) - we all know what happened next. The rug is pulled from under our feet, much like it was for Gibney, he'd been lied to constantly just like the whole world. He reveals that Armstrong may have transfused blood before his triumph on Mt Ventoux, the final piece of hope snatched away. OPRAH: And your comeback, do you regret now coming back? LANCE: I do. We wouldn't be sitting here if I didn't come back. In the post-Oprah interview Armstrong is still defiant, he rejects that he was ever offered a deal by USADA, he rejects that he doped in his comeback and most poignantly he rejects that history will see him as a cheat - he is still the winner of seven Tour de France titles. Gibney finds it difficult to sympathise, he had been lied to before why not again? But he still finds it difficult to reject completely, Gibney still wants to believe in the Armstrong lie. This documentary answers my initial question, how could people not see the evidence? The answer, Armstrong himself, he creates a story; a cancer survivor becomes one history’s greatest athletes whilst destroying those who dispute it. Gibney's personal story is incredibly effective and will be seen as a definitive documentary on the subject - how history’s greatest cheat deceived the entire world and almost got away with it.